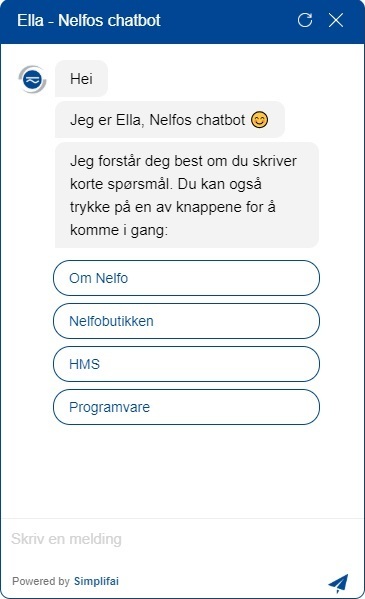 The national association Nelfo in NHO has now launched the chatbot “Ella”. With a member group of around 1600 companies that are in continuous change, it has been important for Nelfo to reach their members through new channels. Ella makes it possible to provide immediate support and to make useful information more accessible. As the chatbot is connected to Nelfo’s online store, Ella can also offer to find the right products and courses for the members. The launch of Ella is the beginning of a larger improvement and streamlining of the member support. – The goal is that all routine requests in the long run should be handled automatically, says Harald Lid, Director of Economics and Organization in Nelfo.